The best hostel I have ever stayed! Great location, friendly staff, and amazing food. The best place I’ve ever been to. Everything was excellent. Great hostel for the money, staff are awesome and really get the party going. The food is worth the 10 euros!! Eat as much as you want as well - including SANGRIA! Beds were comfortable and private (Large lockers as well), but tiny pillows. Bring your own towel! Awesome Hostel walking distance to the main sights and streets! This was my first hostel experience, couldn’t be more happier to have spent it with yeah hostel. They have so many things to offer, walking tours, breakfast and dinner, pub crawls. The staff are amazing and felt like best friends right away. Thanks again yeah hostel! Great hostel! Honestly may have been cleaner than a hotel room. Spacious beds, quiet and dark at night which allowed for a great night’s sleep! Great hostel. It was very clean, had friendly staff and was well located. The bedrooms are modern and spacious and have individual curtains on the beds which is great to get a good nights sleep. They offer a reasonable buffet breakfast with options for everyone. It is not in the centre of the city but it is very close to the metro and some cool restaurants. Definitely recommend La Pepita / La Cava down the road for some Tapas. Highly recommend to do their Gothic Quarter walking tour. I had a really good time in this hostel! The staff are nice and welcoming and were willing to show you a good time whether on a walking tour (shoutout to Lucia!) or during dinner. Speaking of which, the food they offer at the hostel is pretty good, their buffet breakfasts especially! The hostel is located in a good location making it convenient to get to different places. 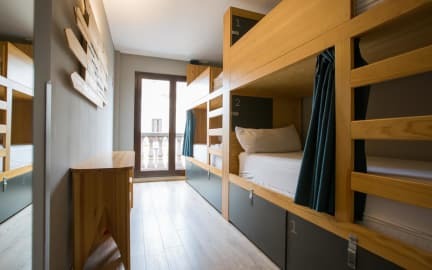 I had a fantastic experience in Barcelona and it was partly due to this hostel being a great hostel! Really nice, clean hostel with great facilities. Location is pretty spot on as well. Maybe could benefit from a little more community atmosphere, however as I was out and about being a tourist most of the days I may just have missed that side of the hostel. Staff are all very polite and helpful. I wish the top bunks had curtains like the bottom bunks to keep out the light. The washrooms in room smelled awful 24/7. Wifi was slow at times. Other then that, Great location.